Co-owners Kaity Cimo (left) and Katharine ReQua outside their store “For Now,” a retail incubator for upcoming brands. Despite what its name might indicate, For Now isn’t a typical pop-up. 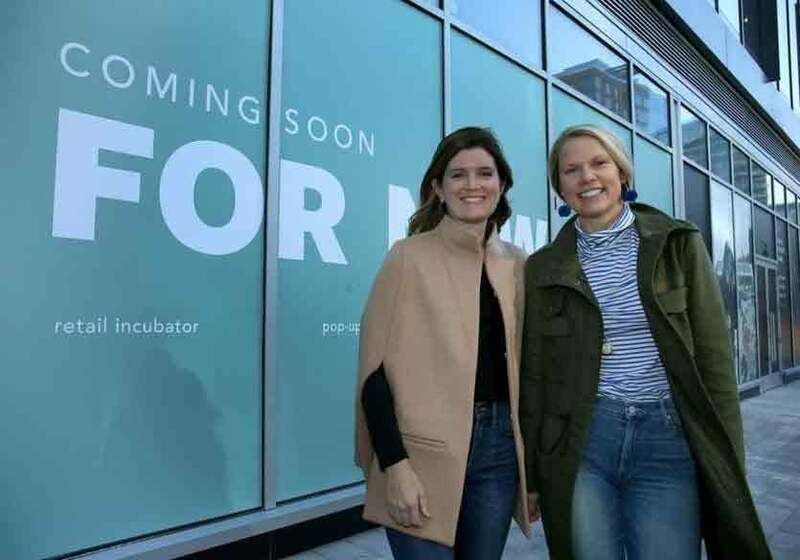 The shop, which is scheduled to open Dec. 7 in One Seaport, will be a retail incubator, providing a place for a rotating cast of Web-based brands and up-and-coming labels looking for face time with customers. One major piece of the puzzle is figuring out how customers can interact with products. As leasing costs continue to rise across the city, it’s become harder for upstart brands to afford physical storefronts —even rents for pop-up shops can be out of reach, Cimo says. That’s where For Now’s storefront might help. The showroom will feature an assortment of brands on a short-term basis — typically about three months. It will be staffed by Cimo and ReQua, who will promote the products and also work on sales and marketing for many of the brands, which will include local furniture company Priley Lane, handbag designer Alaina Marie, and jewelry maker Moonlight + Sage. The goal is to offer a more stable environment for small brands that have been selling at weekend markets like SoWa, or trying to build a brand exclusively online. “We can take away the human capital, which is huge for the brands, and it alleviates a lot of the pressure,” Cimo says. Retail incubation is still a nascent concept, but it’s also happening elsewhere in the region. The Shop on Newbury Street is playing host to short-term pop-ups for various brands throughout the holiday season. Bow Market in Somerville will provide a series of semi-permanent market stalls for food vendors and other small brands when it opens next spring. And gift shops like the Crompton Collective in Worcester merge the flea market concept with modern makers who want more than an Etsy storefront. If you’re in the business of selling expensive down jackets to an international audience, you could do far worse than setting up shop in Boston’s Prudential Center,where Canada Goose opened its first standalone flagship store in the region over Thanksgiving weekend. It’s the seventh location for the maker of $1,600 parkas, and the fifth to open this year alone. The plan is to have 15 to 20 stores by 2020. The Boston shop is a tribute to the 60-year-old Canada Goose’s “arctic heritage,” says chief executive Dani Reiss, the grandson of the brand’s founder — the interior features a selection of Canada-made artwork, and rare pieces from the company’s archives. It’s been a big year for the Toronto-based outdoor brand, which went public in March. Since then, its stock price has steadily ticked upward, and the company’s revenue this year has grown by 34 percent. Boston-based Bain Capital — which first invested in Canada Goose in 2013 — controls about 70 percent of the company’s stock. The push for the company to have its own footprint, instead of relying on wholesalers, is a big part of its strategy for growth, says Reiss. “We are a global brand. For us, it’s important that we have direct connections with consumers.” Those connections are paying off — direct-to-consumer sales have reached $16 million, according to Canada Goose’s most recent filings, up from $4.2 million in the second quarter of this year. It seems things are looking up for down. Small Business Saturday and Giving Tuesday technically are over, but in Newton and Needham the efforts are ongoing, as nonprofits in both communities are working to remind shoppers to patronize local businesses. Small businesses often support local charities in big ways. A 2015 survey by the small business company Alignable found that small- and medium-sized businesses direct 90 percent of their giving to local organizations. The Newton Needham Regional Chamber helped coordinate ads and social media messages with local nonprofits to help urge their followers to “support the local business that support us.” Beth Israel Deaconess Hospital Needham, Centre Street Food Pantry, Charles River Center, and Family Access of Newton are among the local nonprofit partners using the tagline in their holiday promotions.